I saw a blue moon recently. Not the wheat beer in my fridge – the big, bright object in the night sky. 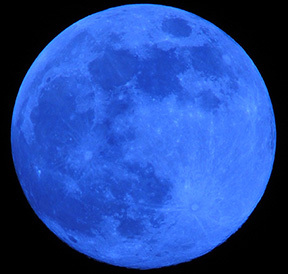 For those unfamiliar with the term, a “blue moon” is usually defined as the second full moon in a month. Since the lunar cycle is approximately 29.5 days and months are typically 30 or 31 days long (February notwithstanding…which, by the way, never experiences a blue moon) it doesn’t happen very often. The next one won’t occur in our area until 2018. Hence the saying “once in a blue moon” to describe an infrequent happening. • “It’s a tough row to hoe.” Meaning a particularly difficult job that has to be done, much like hoeing rocky ground for planting. It is probably not as relevant given the technology available to farmers today. • “You’re starting to sound like a broken record.” Meaning a person that is repeating the same basic idea repeatedly. I actually have said this to my kids in the 90s while sorting my CD collection. The irony was lost on me then. Probably due to the fact that my thought processes had shut down because they were repeating the same thing over and over and over again. While technology has caused some of these sayings to be outdated, dependence on the lunar cycle means that “once in a blue moon” should never be outdated, as long as: (a) the moon hasn’t been stolen by Gru; or (b) we’re not living on Kepler-452b instead. In doing the math of occurrences of blue moons between 2009 and 2021 (according to Wikipedia) I figured that the chance a blue moon would happen in a given month is about 6 percent (9 times in 133 months). Which is convenient for this article because it really is about test precision using the d2s limit – which is the difference between two individual test results that should be exceeded only 5 percent of the time when the test procedure is performed properly. In other words the d2s limit for a test should only be exceeded about once in a blue moon. Why is this statistic important? For users, it can help in understanding what acceptable variability is for a certain test. For example, for the RTFO DSR test (AASHTO T315, ASTM D 7175) the published multi-laboratory d2s% is 22.2 percent. This means that results from two labs performing tests properly should not be different by more than 22.2% from the average of the two labs. If the two results are within the d2s limit then each could be considered a valid test result and – following the procedures in “ASTM D3244, Utilization of Test Data to Determine Conformance with Specifications” – the results should be averaged to get an assigned test value (ATV). • The specification limit for the RTFO G*/sin δ value is 2.20 kPa. • Multiplying the specification value by 22.2% yields a value of 0.48 kPa (rounded down). This is the acceptable range of two results whose average is exactly the specification value. In other words, Lab A runs the RTFO DSR test on a binder and gets a G/sin δ value of 2.43 kPa. Lab B runs the same test on a split sample and gets a G/sin δ value of 1.97 kPa. Can both of these results be correct? Since the d2s limit for this pair of data is 0.48 kPa and the range between the test results from the two labs is 0.46 kPa, then ASTM D3244 would suggest that both test results are equally valid – even though one passes and one fails the specification. The average of the two results is 2.20 kPa which meets (barely) the specification minimum. Obviously if Lab A and Lab B continue to have the type of differences shown above, they’ll need to work together to tighten their procedures. Random variability is one thing. A consistent bias in testing is another. Understanding the d2s limits for a test can help users and suppliers know when results need to be further examined and when they are simply a result of normal, random variability. This can definitely help reduce the frequency of disputes over testing to no more than “once in a blue moon”. Random variability is one thing. A consistent bias in testing is another. For more information on AI’s laboratory services and testing variability please visit the AI website (www.asphaltinstitute.org) or contact Mike Anderson (manderson@asphaltinstitute.org). For more information on Kepler-452b, please find an astrophysicist or an astronomer or someone who watched “Interstellar” or visit NASA’s website (www.nasa.gov). Mike Anderson is the Director of Research and Laboratory Services at the Asphalt Institute.